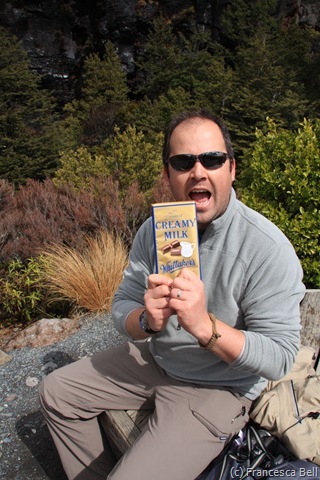 Central North Island simmers and steams, bubbles and spews. 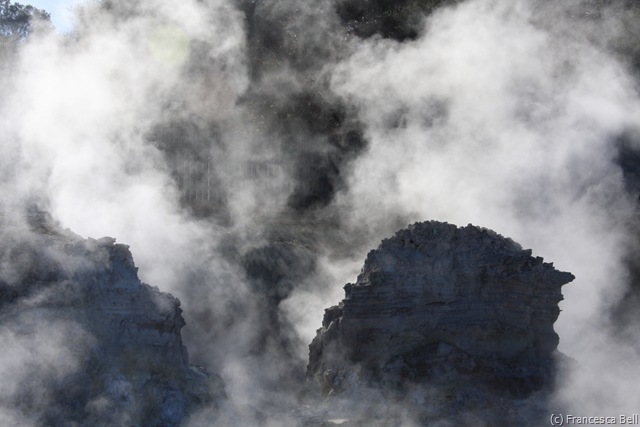 The pungent smell of sulphur emanates from the rising hot steam in a harsh and uninviting landscape. Lakes have formed in the calderas of volcanoes where once mighty eruptions occurred the likes of which we have not seen in our lifetime of which epic stories are told. Mud pools bubble at the surface, great fountains of boiling water charge out from large pools below the earth’s crust and minerals colour the bare craggy rock in rich primary colours. Plant-life of course finds a way to take root in the surrounding area and with it humanity thrives. Population numbers here are high by NZ standards despite the two vast dormant volcanoes hidden beneath Lakes Rotorua and Taupo. 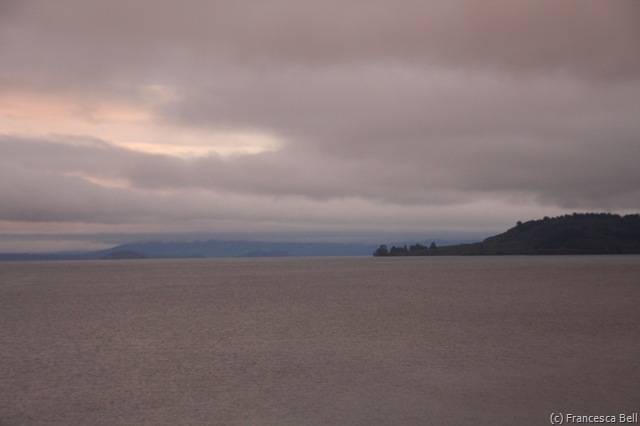 Lake Rotorua at dawn is a sight to beheld. The lake steams against the blue, blue sky as the light glistens across the still blue water. 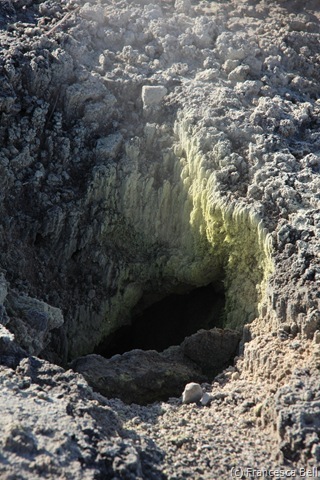 The smell of sulphur permeates the air and birds fill the skies in search of a cool spot to rest. In this environment you become increasingly aware of the earth as a living breathing organism. To really appreciate this amazing scene you must take a dip at the Polynesian Spa. There are eight outdoor pools to dip in and out off at leisure and the most beautiful lakeside view. 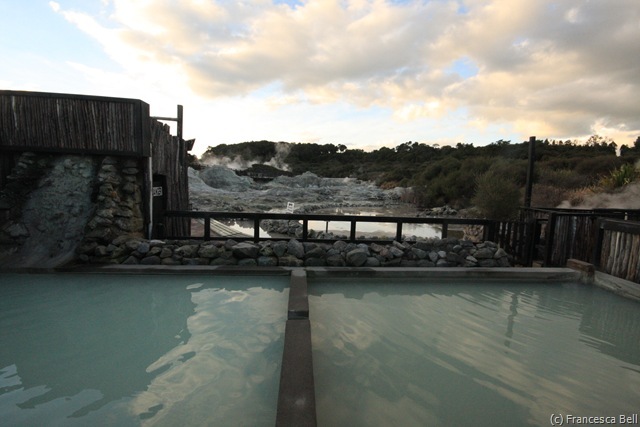 The thermal pools are cloudy white with minerals and organic matter which floats around you. The advise is to dip for only 15 minutes at a time and rehydrate often as it is easy to overheat, but in return you get to look like you are on the cover of Conde Nast Traveller magazine. For a less crowded experience go straight here first thing in the morning. Rotorua township is not particularly remarkable from an ascetic viewpoint, but gems can still be found here. 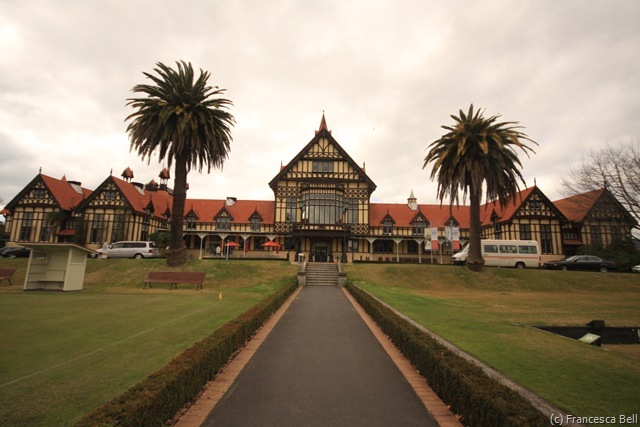 Top of our list was the Rotorua museum, within walking distance from the spa, it is held in a beautiful old Bath House. 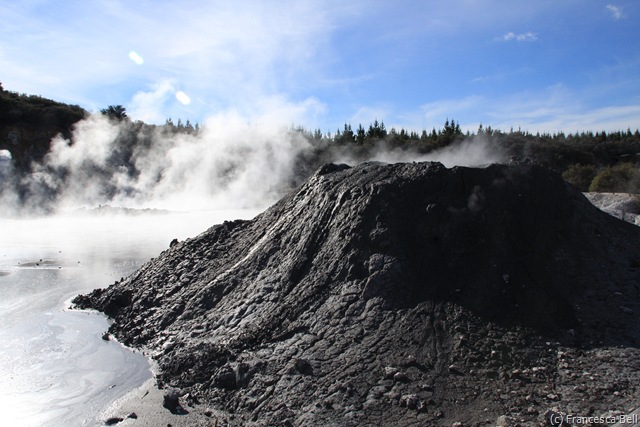 The museum is mainly dedicated to its heritage as a geothermal spa and therapeutic treatment centre. In its heyday treatments were administered in individual rooms with sunken baths powered by the lake and electrocution therapy was even used. An engaging exhibition also details the events of Mt Tarawera eruption of 10 June 1886 where many villages were buried along with the world renowned Pink and White Terraces. Described as the ‘Eighth Wonder of the World’ people from all over the world would have come to bathe in the terraces geothermal waters. The Bath House roof terrace enjoys extensive views of both Rotorua township and the lake. 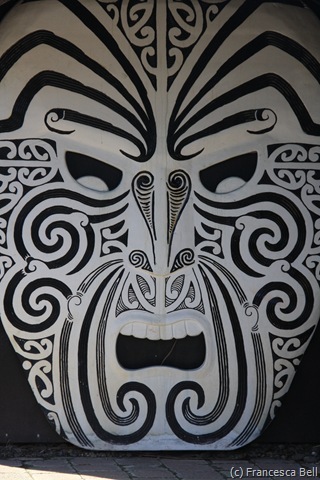 Ever present throughout New Zealand and no less so here is Maori culture. Traditional Maori evenings can be enjoyed including tasting hangi (a traditional meal cooked in the ground). Though this offers an interesting insight into their culture we chose to miss this on overly-touristic grounds. Later we learnt that to sample ‘good’ hangi you must attend a real Maori ceremony. I have yet to taste hangi but hope it will challenge my taste-buds when I do. A historically significant Maori church sits on the shores of the lake but sadly we were unable to navigate the tiny old streets in our ‘Mammoth’ campervan so we leave you this gem to discover. 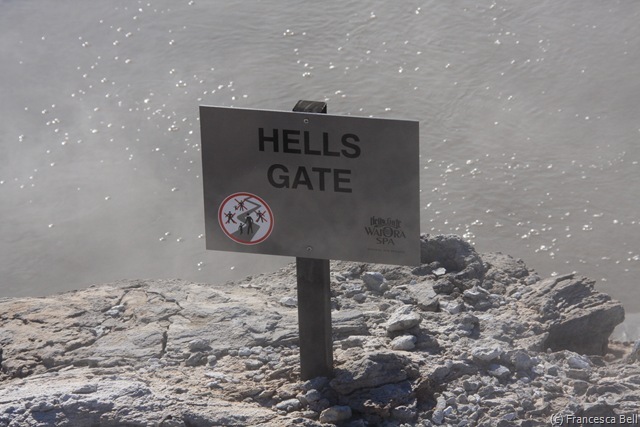 Just a short journey north east of the lake leads you to the geothermal park of Hell’s Gate. The stench of sulphur invades the nostrils with even more vigour here, but this is an impressive place not to be missed. 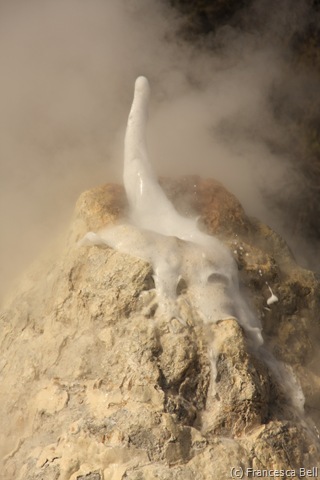 From small fumaroles that puff like a Cuban cigar to great chasms that boil and steam with a fog like haze. To see is to believe! It is like stepping onto another planet that has no concept of plant or animal life. Here everything will kill you. Still there is beauty and pleasure to be found even in this most alien of places. James ruminating in the warm mud spa and the thermal pool we enjoyed looking over Hell’s Gate! Strangely enough you can enjoy a mud spa and thermal pool here! Having enjoyed the luxury of the Polynesian Spa that morning the thermal spa here was not a draw for us, we came for the mud spa! During off peak season you get a mud pool to yourselves which we were glad of as it is quite an intimate and fun experience smearing each other with thick slimy clay-like mud from the bottom of the pool. Now the fun really starts when rinsing the mud off in the pool and then showering the rest off before entering the warm and inviting thermal spa pool. Needless to say the shower was ice cold and my slightly padded bikini top had absorbed an insane amount of residual mud. James was only too thrilled to watch me shriek and squirm in agony whilst I cleaned myself and my bikini! Finally three minutes later we quietly slipped into the spa only to realise that everyone in the spa had heard my screams! Luckily the heat of the spa camouflaged my embarrassment, but did not stay long! DOC campsites grant you the freedom that holiday parks just can’t and Lake Rerewhakaaitu at the base of Mt Tarawera was no exception. The low morning mist over the lake felt as if you were the first ever people to enjoy this place. 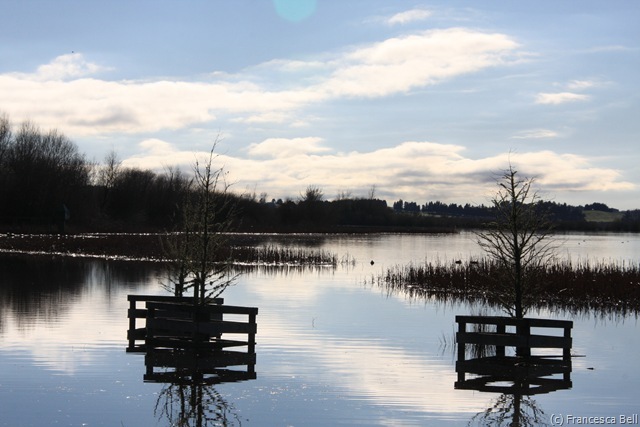 Ducks quietly paddles across the reed riddled lake. There was a sense of comfort knowing such tranquil places exist between the effervescence of the region. 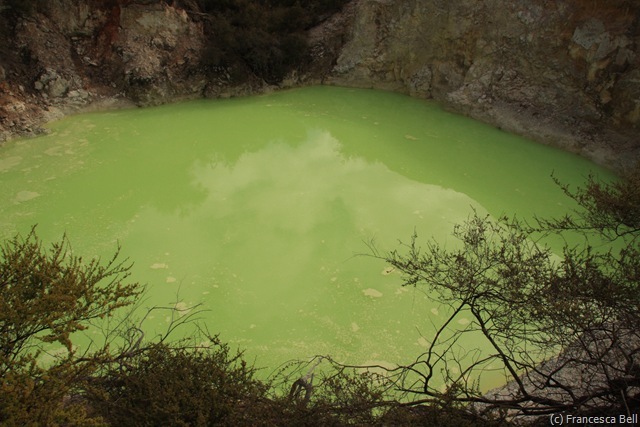 In contrast, further south Wai-O-Tapu is a vast geothermal hotspot complete with rivers of sulphur, lakes of multitudinous colours, cooking pot pools and even pools the shape of Australia! 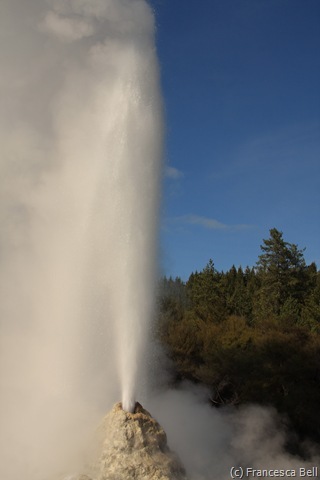 Though the highlights here are the famous Champagne Pool and Lady Knox Geyser. 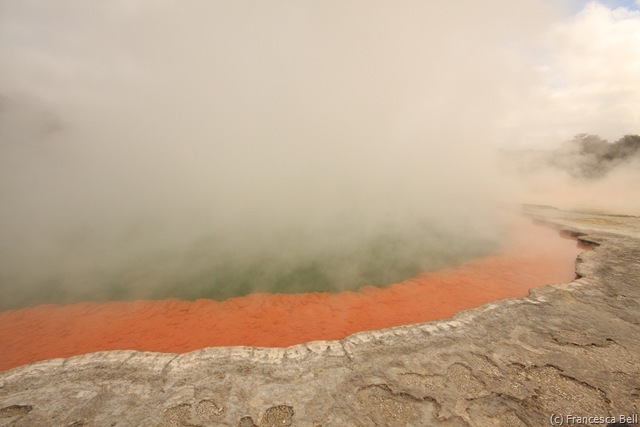 The Champagne Pool, shown above and at the top of this feature, effervesces with steam from an extremely deep flute-shaped pool edged by a magnificent rich primary colour palette. The orange is created by layer upon layer of arsenic, so “Don’t lick it!”. At 10:30 daily Lady Knox lets off some steam! Lady Knox Geysers was discovered by unsuspecting criminals using the water to wash their clothes. In doing so washing powder was added to the water in the funnel which acted as a catalyst and caused the first known eruption from the vast underground pool. Eruption heights depends of the volume of water within the underground pool, but this eruption was considered to be about 50m high. Today it reaches an impressive 30m and is still activated by washing powder at 10:30 each day for the paying spectators. 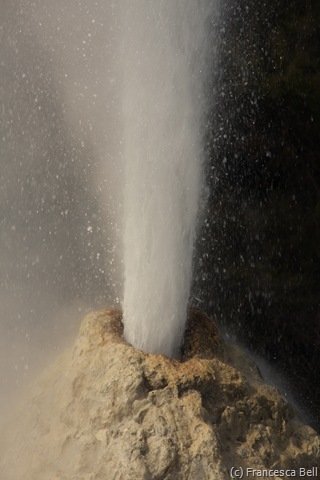 The geyser initially begins to froth and foam at the top, pouring white suds down the protruding funnel as steam rises above. As Lady Knox reaches fever pitch water gushes out with the force of a fireman hose gushing vertically into the air. A blanket of water droplets floats on the wind so camera protection is advised! All said it was touristy but an impressive sight non-the-less. 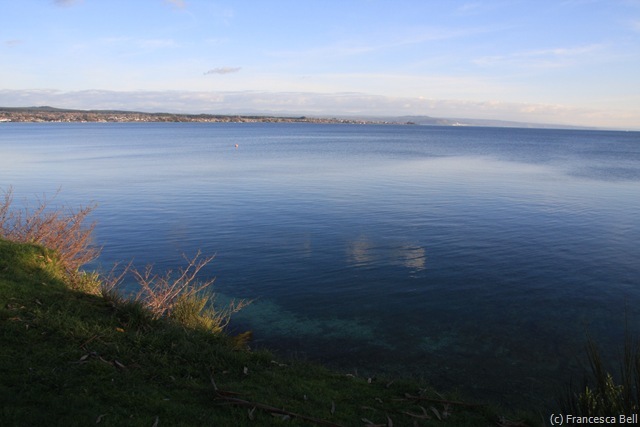 Lake Taupo is the mothership in comparison to Rotorua in size and volcanic prowess. 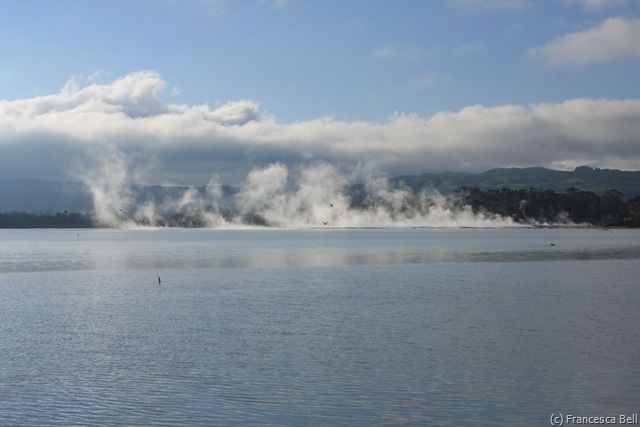 Classified as a dormant supervolcano, created about 26.5 thousand years ago, the last eruption here is believed to have ejected 100 cubic kilometers of material of which 30 cubic kilometers was ejected within a few minutes! Ash from the eruption was reported to have turned the sky red over China and Rome. 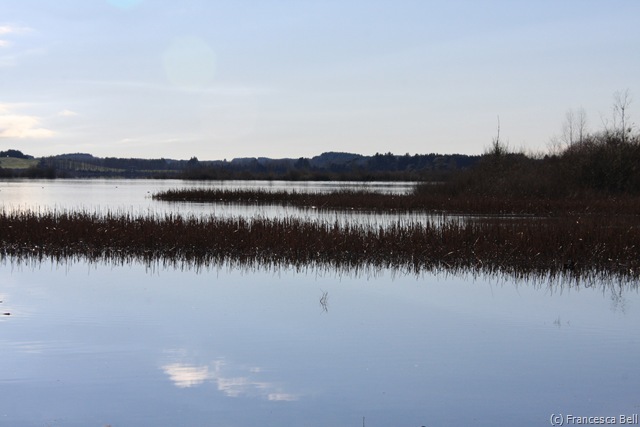 The view over the lake is serene and tells nothing of its violent history. Looking over the shores on a clear day you are blessed with a beautiful view of Tongariro National Park, home of Mt Doom! Lake Taupo is home to fishing in a big way and most particularly trout fishing which reminded me of my Grandfather who was a wonderful trout fisherman. Whilst backpacking everything comes down to price and this activity sure was pricy so we shall saved it for a rainy day in Scotland! Taupo is also a great place for to make a leap out of a plane, though we chose Queenstown for all our crazy adventures. Lake Taupo is a wonderful place in sunshine but when the rain sets in, which it did for 5 days after we arrived, it is time to seek drier climes. The East coast is the right place to hole out in with its potent vineyards, art deco buildings and dry coastal air and so we returned to the region a few days later. 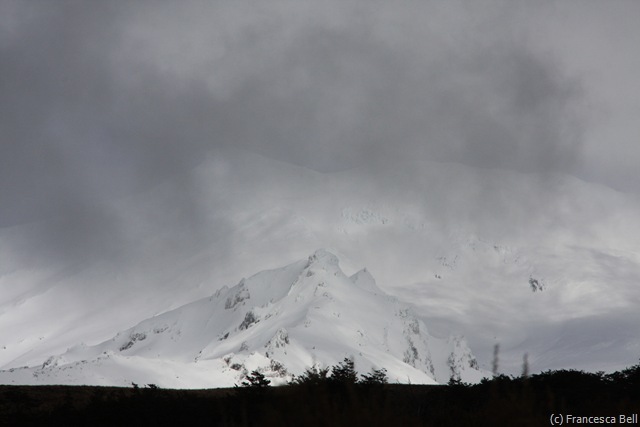 Volcanoes in North Island come in all shapes and sizes, from lake-filled to snow-capped. But none more iconic or famous than the cone-shaped volcano of Mt Ngauruhoe encapsulated forever in Lord of the Rings as Mt Doom. 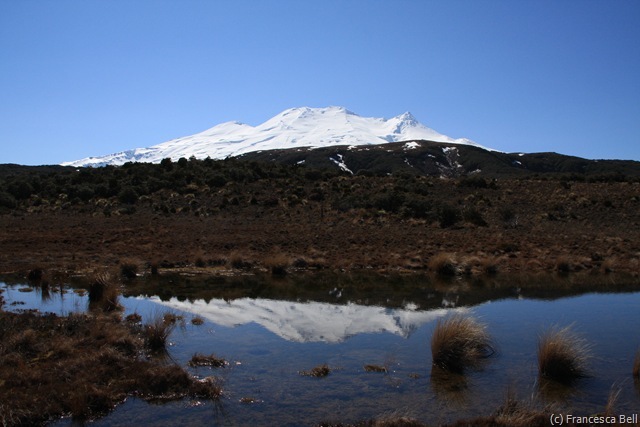 Tongariro National Park is home to three impressive beasts of volcanoes; Mt Ruapehu, Mt Ngauruhoe and Mt Tongariro itself. When the clouds and rain hugs the towering slope of the mountains you would be fooled into believing there are not mountains here at all. Even with a fine mist of persistent rain crossing gently over the peaks this is an impressive place to be. We arrived to just such a mountainless landscape and Whakapapa DOC campsite (pronounced Fakapapa in Maori) was a great place to reside in bad weather. We recommend it for its location, wilderness feel, well stocked shop and pleasant staff. The Tongariro Crossing from Mt Ngauruhoe to Mt Tongariro is talked about by everyone here. “Have you done it?” “Are you doing it?” But the main concern is not your laziness level it is the weather conditions. Sadly for us it was still in the realms of experienced trampers with all the gear in early spring. Skiing is still possible in September, but not a patch in the European Alps so we opted for a beautiful tramp through heathland to an impressive waterfall to take in views of the three mountains. Our three hour tramp and for James that meant “Scroggin’ time” again. 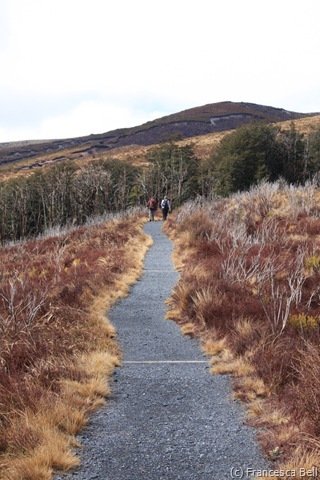 On the southern slopes Mt Ruapehu, Ohakune is another lovely spot within the National Park. The town has a Verbier vibe about, with shops aimed towards the moneyed crowd. There is a decent DOC site and a lovely Holiday Park with carved wooden basins in the amenities, luxury. The walking track to Waitonga Falls has impressive views of this mountain and great reflections on a still day. 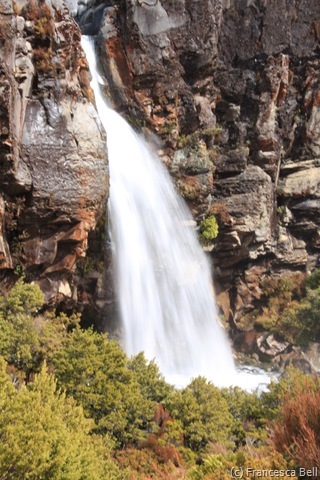 The LOTR location for Gollum’s waterfall was filmed in these parts. The volcanic heart of North Island is both impressive and intriguing and makes you feel small and powerless. You again an understanding of how much we take the ‘soft side’ of nature for granted. Here you do not have this luxury as the hostility of the environment is all encompassing. Ultimately it gives you an new perspective on the world we live in and its ultimate prowess.